A complimentary continental breakfast is served on weekdays from 6:00 AM to 9:30 AM and on weekends from 7:00 AM to 10:30 AM. Make yourself at home in one of the 109 air-conditioned rooms featuring microwaves and flat-screen televisions. Complimentary wireless Internet access keeps you connected, and cable programming is available for your entertainment. Private bathrooms with shower/tub combinations feature deep soaking bathtubs and complimentary toiletries. Conveniences include safes and desks, and housekeeping is provided daily. With a stay at Sonesta ES Suites Ann Arbor in Ann Arbor, you'll be a 2-minute drive from Briarwood Mall and 8 minutes from University of Michigan. 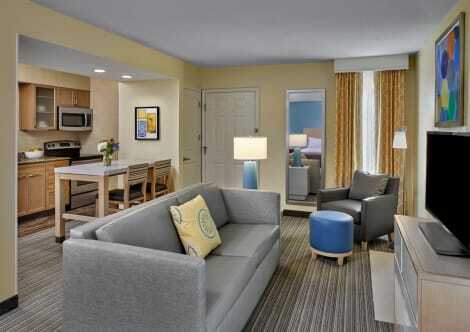 This aparthotel is 2.8 mi (4.5 km) from Michigan Stadium and 3.6 mi (5.7 km) from U Of M Hospital. When you stay at TownePlace Suites by Marriott Ann Arbor in Ann Arbor, you'll be near the airport, a 1-minute drive from Briarwood Mall and 8 minutes from University of Michigan. This hotel is 2.4 mi (3.9 km) from Michigan Stadium and 3.6 mi (5.9 km) from U Of M Hospital. Featured amenities include a 24-hour business center, complimentary newspapers in the lobby, and dry cleaning/laundry services. Planning an event in Ann Arbor? This hotel has facilities measuring 3500 square feet (325 square meters), including a conference center. Free self parking is available onsite. Stop by the hotel's restaurant, The Bistro, for dinner, or grab snacks at the coffee shop/café. Wrap up your day with a drink at the bar/lounge. Cooked-to-order breakfasts are served on weekdays from 6:30 AM to 10:00 AM and on weekends from 7:00 AM to 11:00 AM for a fee. Enjoy American cuisine at Malletts Creek Bar&Grill, a restaurant which features a bar, or stay in and take advantage of the room service (during limited hours). Buffet breakfasts are available daily from 7 AM to 10:30 AM for a fee. Make yourself at home in one of the 204 air-conditioned rooms featuring refrigerators and flat-screen televisions. Complimentary wired and wireless Internet access keeps you connected, and satellite programming provides entertainment. Bathrooms have bathtubs or showers and complimentary toiletries. Conveniences include desks and coffee/tea makers, and housekeeping is provided daily. lastminute.com has a fantastic range of hotels in Ann Arbor, with everything from cheap hotels to luxurious five star accommodation available. We like to live up to our last minute name so remember you can book any one of our excellent Ann Arbor hotels up until midnight and stay the same night.